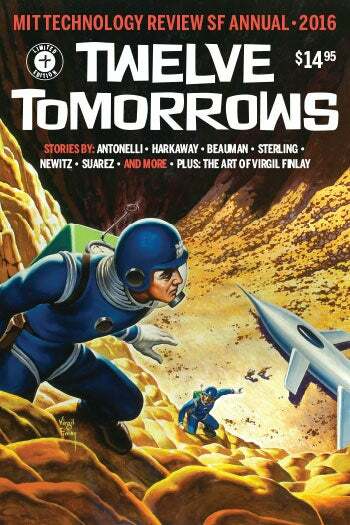 MIT’s Technology Review has a bit of a secret: just about every year, they put together a science fiction edition titled Twelve Tomorrows. It’s one of the best collections of short science fiction out there, and you can now preorder the upcoming issue. This upcoming issue features a pretty incredible group of authors: Paola Antonelli, Ned Beauman, Nick Harkaway, John Kessel, Pepe Rojo, Bruce Sterling, Charles Stross, Daniel Suarez, Jo Lindsay Walton, and our very own founder, Annalee Newitz! Technology Review released the first installment of the series in 2011: TRSF, which styled itself as “The best new science fiction, inspired by today’s emerging technologies.” That first issue featured Joe Haldeman (a professor at MIT at the time), Elizabeth Bear, Tobias Buckell, Pat Cadigan, Ken Liu, Vandana Singh and quite a few others. Since then, they’ve published issues in 2013, 2014 and this year. When I picked up the first issue back in 2011, it blew my mind: this was an excellent collection of hard SF stories that were all incredibly relevant, interesting and exciting. The following year featured an excellent table of contents: Brian Aldiss, David Brin, Greg Egan, Nancy Fulda, Kathleen Ann Goonan, Nancy Kress, Paul McAuley, Ian McDonald, Richard Powers, Justina Robinson, Cheryl Rydbom, Allen M. Steele, Neal Stephenson and Peter Watts. Somehow, I missed last year’s edition, but fortunately, you have the option to order back issues, or even pick up the entire run while you’re at it. The magazine is available as a print or digital copy.